CPW investigators are still seeking information on the poaching of two mountain goats on Quandary Peak on July 3. The goats were shot at close range near the peak's summit. BRECKENRIDGE — Thanks to donations, Colorado Operation Game Thief is increasing the reward offer from $5,000 to $15,000 for information leading to an arrest or citation in the case of two mountain goats that were shot and found dead on July 3, about 2.8 miles up the Quandary Peak Trail. Anyone with information can call or email Operation Game Thief at 1-877-265-6648 or game.thief@state.co.us to report any information. Callers or emailers may remain anonymous if they choose. For more information on CPW regulations or stopping poachers, visit http://www.cpw.state.co.us. 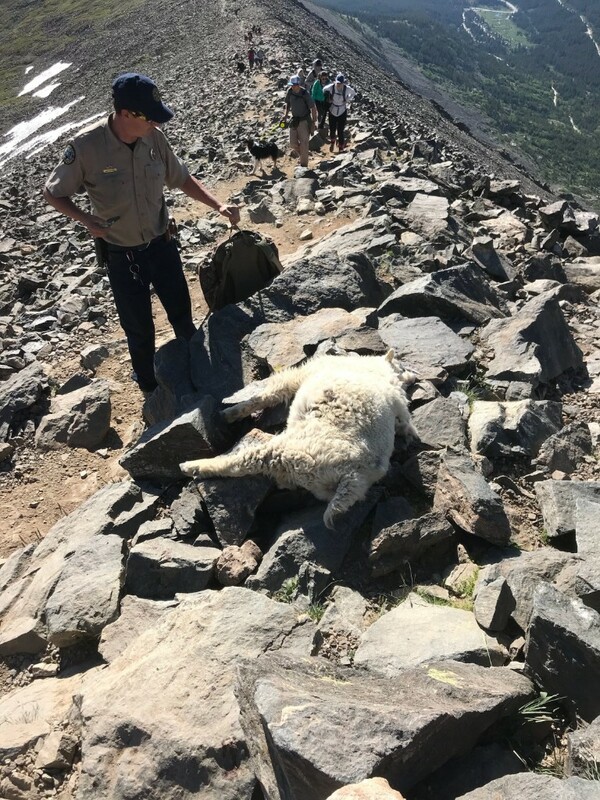 On July 3 at approximately 3:30 p.m., two young male “billy” mountain goats, estimated to be between 1-2 years old, were shot and killed just over a half mile from the summit of Quandary Peak. The mountain goats were shot in the head with a pistol at close range. Wildlife Officers ask anyone that was hiking to or from the summit on Tuesday afternoon to report any suspicious activity. “Killing a mountain goat in this manner is a felony, and these poachers can face jail time, license suspensions and fines that can reach over $20,000 per animal,” said Tom Davies, District Wildlife Manager with CPW.